Plochmann Lane: New Chris Bergson album (Imitate the Sun) releases today! 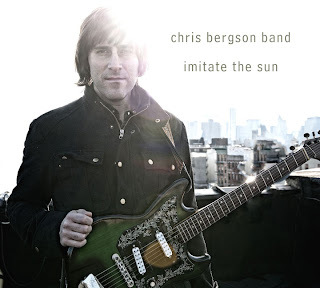 New Chris Bergson album (Imitate the Sun) releases today! I am thrilled to announce the release of Imitate the Sun - the new CD from the Chris Bergson Band! The album has already received 4 stars in MOJO and has been enjoying national radio play (currently #6 on the NY Roots Radio Charts and #20 on the National Blues Radio Charts). Recorded at Brooklyn's Excello Recording, Imitate the Sun features Jay Collins, Bruce Katz, Matt Clohesy, Tony Leone and two tracks with a horn section arranged by Jay Collins featuring Kenny Rampton and Chris Karlic. Imitate the Sun contains six strikingly original songs and four thoughtful covers that allow his fertile creativity free reign... Bergson makes every track a complete and rewarding musical statement... Chris Bergson is a man on a mission with his blues-breaking guitar, passionate vocals and literate lyrics. He is out to leave an indelible mark on the world of music and succeeding spectacularly with his life-affirming art that both consoles and excites. The sum total is an impressive and growing body of work that reaches across the ages and boundaries. We hope you enjoy the new record! You can listen at www.chrisbergson.com and the album is available for purchase at Amazon, iTunes, CD Baby, eMusic, Rhapsody and Napster. Tuesday, May 10 - Tonight! Thanks, everybody! I hope you can make it out! Chris Bergson is a New York guitarist, singer and songwriter.